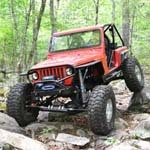 nea4wd.org • View topic - Raffle question?? NTC will be raffling a full cage up to 100' of tube installed, donated by Centralmassoffroad. 100% of the proceeds will be donated to charity. My question is what do people think is a good price per ticket for such a prize? I would recommend 1 for $5 and 5 for $20. $20 is like a magic number and you want the best deal at that number. And you might even consider doing 10 for $20.